Think of Haw Par and a lot of words come to mind: mythical, fascinating, wonderful, amazing. To the unsuspecting, however, Haw Par comes as a surprise. The drive down Pasir Panjang Road is unmissable — a variegated façade taking up more than a few metres of the entrance, juxtaposed against the drab industrial surroundings of the area. Welcome to the amusement park of hell. Also known as Tiger Balm Gardens, the site was built by brothers Aw Boon Haw and Aw Boon Par in 1937. Not coincidentally, they were also the developers of the now internationally-known heat rub, Tiger Balm. The creation of the theme park not only served as a medium to promote the then-unknown ointment, it was also a venue for teaching traditional Chinese values. It was then renamed ‘Haw Par Villa Dragon World’ in 1988 when the Singapore Tourism Board took over, but due to dismal attendance over the years, was given its old name back in 2001. A walk through this grim Hadean fairytale evokes a myriad of feelings: mainly curiosity and amusement. The 1,000-odd statues and 150 giant plaster dioramas depicting scenes from Chinese folklore and history are a sight to behold. Oddly enough, amongst the seeming homogeneity are statues of koalas and kangaroos, and one lone Statue of Liberty — an explicit hat-tip to Australia and America, one can only surmise. It is all quite unexplained. 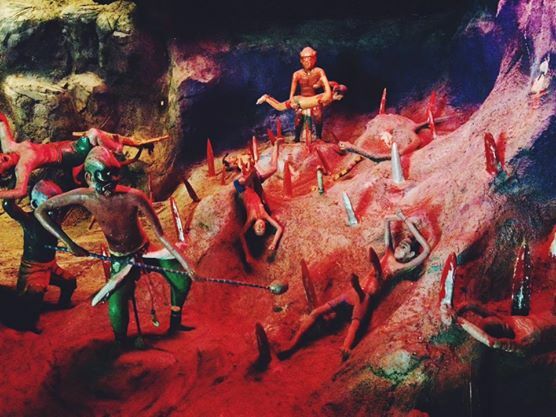 The best-known attraction in this bizarre theme park is the Ten Courts of Hell), featuring gruesome tableaux of Hell depicted in Chinese and Buddhist mythology. It used to be set inside a -metre long Chinese dragon with water running inside it (to enter, one had to sit in a boat), but it is now hidden by grey stone walls, making the journey by foot all the more amazing and, to a certain extent, frightening. Two large statues of the Guardians of Hell, Ox-Head and Horse-Face), oversee the entrance, a hint towards what is to come. The various ‘courts’ of hell are shown in painstaking detail, along with a placard stating the sins that warranted each punishment. Robbers are thrown into blocks of ice, tomb raiders are tied to red-hot copper pillars and grilled, tax dodgers are pounded by stone mallets, and murderers have their heads and arms chopped off. What is perhaps the grisliest spectacle is an executioner pulling tiny intestines from a man tied to a pole, colons fully visible. What sin would require a punishment so gruesome? Cheating during exams. Luckily (or not), the concept allows for reincarnation after due punishment has been carried out. The return back out into the open is refreshing, the macabre depictions having effectively done their job. One can easily spend up to two hours taking in the various attractions, learning about the numerous legends that form a large part of Chinese and Confucian tradition. There are dioramas of scenes from Journey to the West Legend of the White Snake e), and Romance of the Three Kingdoms and the Goddess of Mercy (); the twelve animals of the Chinese zodiac (), and others. 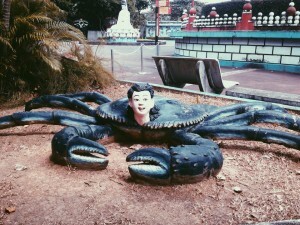 Some perplexing statues littered around the park include a female human-headed crab, scenes of animals fighting (a giraffe taking on a goat) and strange-looking mermaids. This results in an air of absurdity and mystery that’s present throughout most of the theme park. The success of Haw Par Villa has been shaky, despite various efforts to reinvigorate interest in the place. The free admission provided since 1998 has been largely compelled by huge losses incurred as a result of low attendance. Over time, the park has inherited a look of disuse since its last big restoration in 1994: the dioramas are not looking as effervescent as they used to, and paint is peeling from the statues. One can visit even on a weekend and still see it almost deserted, save for a few others milling about the 1 hectare space. Closed sections point to an uncertain future. Last month, however, as part of the ‘Reminisce, Rediscover, Celebrate’ campaign launched to commemorate fifty years of tourism development in Singapore, Haw Par Villa has been given a new lease of life. There were free guided tours and talks curated and conducted by local heritage tour specialists over two weekends as part of a programme called Reliving Haw Par Villa, which met with huge success, seeing an average of 3,000 visitors per day). The Singapore Tourism Board also said that it would continue to seek ways to maintain the heritage and relevance with new programmes. One of them is a series of art projects to be held from April to September 2014, with hopes to enliven the park and encourage the public to continue visiting it. A search of the Internet has also garnered more than a few blogs by youths documenting visits of the site, most of them expressing wonder and awe. All of this ultimately leads to the question: will the magical theme park be reincarnated once again? Only time will tell. 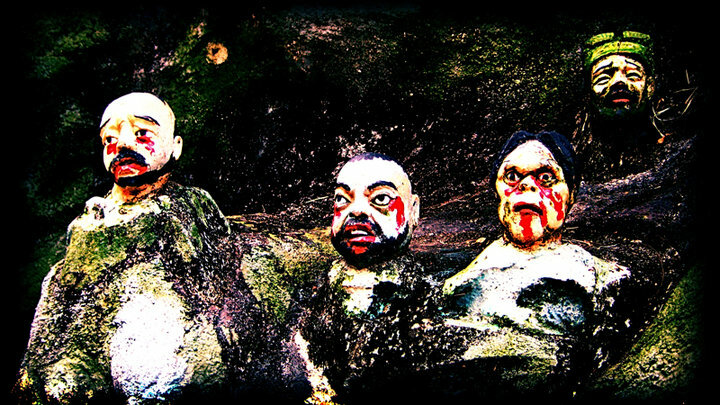 Haw Par Villa opens daily from 9AM-7PM (Ten Courts of Hell closes at 6PM). Take the Circle Line to Haw Par Villa Station and come out through exit A.